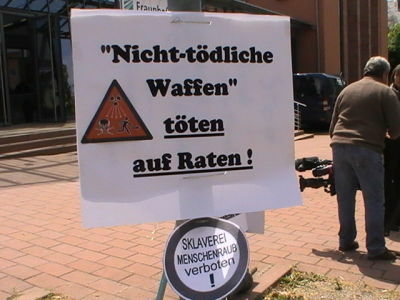 The Demonstration of European and German victims took place under the motto "Human experiments with Non-Lethal- Weapons" on 16th May 2011 in the German city of Ettlingen where the Symposium on Non-Lethal-Weapons took place. 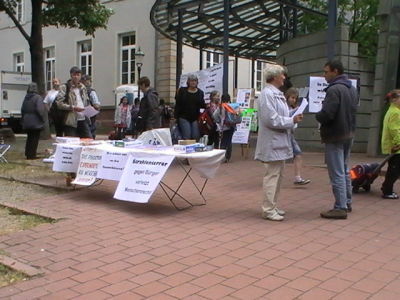 On 17th May 2011 the demonstration was held at the Market Place in Karlsruhe. 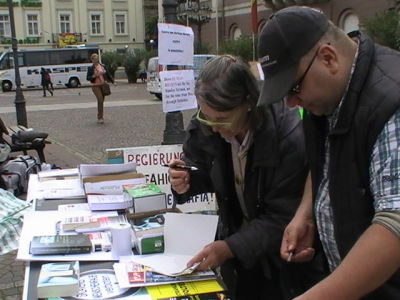 Two weeks before the Demonstration, we forwarded information concerning the Protest to several editorial staff members as well as to a number of TV channels in Karlsruhe and in other cities of Germany and Europe. They actually responded to our invitation and came to Ettlingen on 16th May in order to support us and listen to our activities! 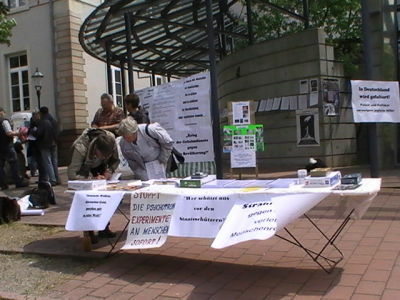 The main aim of the Demonstration was to attract the attention of the many uninformed people in Germany, so as to arouse their interest through press coverage concerning this grave issue. We demanded that an appropriate law be introduced which will bring to a halt the flagrant crimes committed by many criminal organisations as well as by the Police, the Military and the Secret Services. 1. Governments are incapable of fighting electromagnetic terror! 2. You might become a victim! 3. Abusive irradiation technologies on citizens! 4. The Secret Services carry out the war against the population! 5. Truth and justice are murdered with psychophysical weapons!" 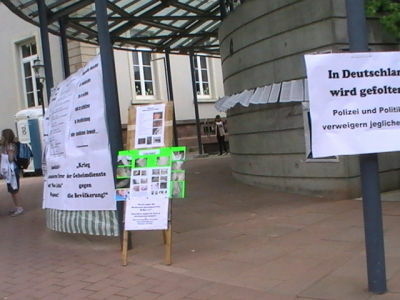 For 2 months prior to the Symposium we contacted many European and German victims in forwarding a large amount of invitations regarding the forth coming protest by electronic post. 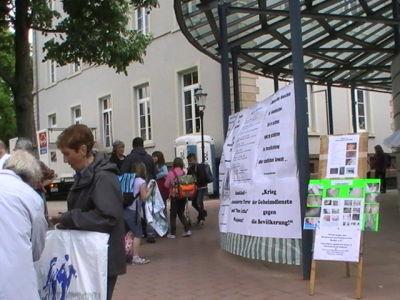 Many victims could not take part in the protest in Ettlingen and Karlsruhe due to various health reasons and lack of funding . The culprits of the State have already ruined the health of many citizens. Therefore, only very few victims were able to assist in making preparations for the forthcoming protest. 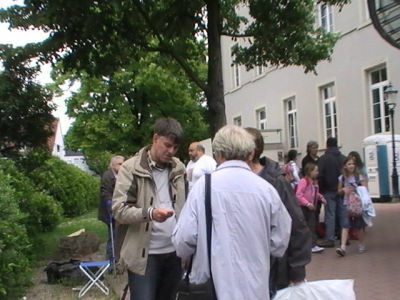 We all met at 10.00 a.m on Monday,16th May 2011 in front of the building where the Symposium in Ettlingen took place. A total of nineteen European and German victims turned up, sixteen victims coming from Germany, with only one Austrian, Danish and Swiss victim. 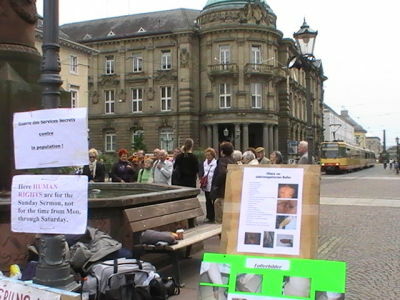 All participants worked very actively and seriously during the two days of protest and we actually succeeded in distributing 1200 leaflets to passers-by, to scientists, to the press and many tourists visiting theTown Hall as well as the City Hall at the market place. 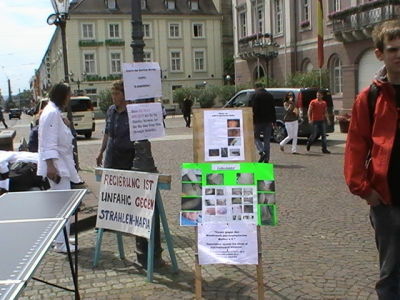 On the 17th May 2011, beginning 10.00 o'clock in Karlsruhe, we also informed many tourists and passers-by about these crimes. We were very much impressed by Harald as he often held a wonderful speech by using a megaphone, meaning that many people in Karlsruhe were able to hear everything he had to say. We were very much impressed by Harald as he often held a wonderful speech by using a megaphone, meaning that many people in Karlsruhe were able to hear everything he had to say. The team-work performed during those two days, shows that we can only defeat those state commissioned psychopaths assembled together. Our posters had a very big effect on many people. During those two days of protest in Ettlingen and Karlsruhe, a private film studio from Berlin made a film about our problems concerning these horrendous crimes being committed to us. In doing this, they certainly supported us very well. We thank them very much for coming to our assistance and to bringing more light into these profound circumstances. 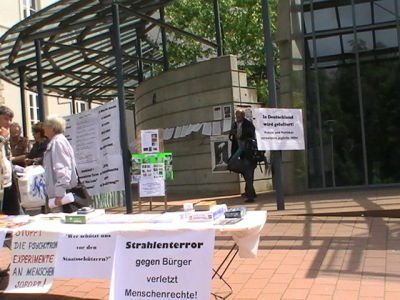 On Monday, at about 12 o'clock midday, a broadcaster of the German Television Station, SWR turned up to offer us support in arranging an interview to explain our protest activities. 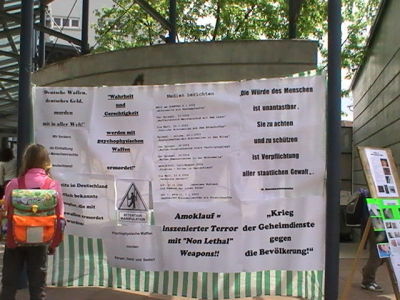 Some participants described the horrendous crimes being committed not only in Germany but worldwide. 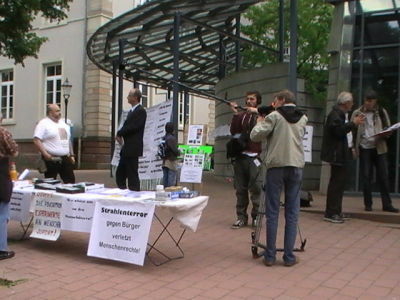 Later on in the evening at around 6 o’clock, the SWR reported about our protest on the Baden News television programme. The press took great interest in our situation. We, therefore, presumed accurate coverage of the whole event. 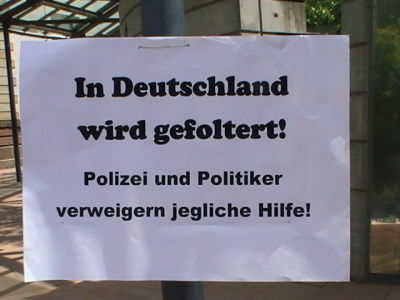 Although we were under constant supervision and observation of well armed and petulant policemen, as well as an employee from Frauenhofer institute plus the Secret Services, we were able to accomplish our well-planned protest. 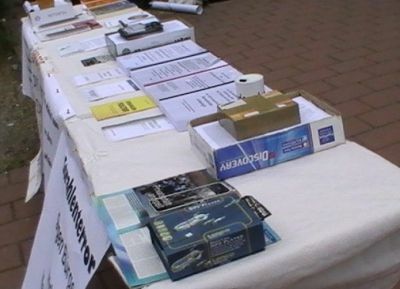 Some citizens were very interested in the information submitted and mentioned that they were already informed about these crimes being covertly committed. Our main objective was to arouse the attention and the interest of the press and certainly of the people of Ettlingen and Karlsruhe not to mention foreign tourists. Even though we were a small group of nineteen protesters, the work together was satisfactory. In our opinion, this event was very successful and it was a pleasure of being able to communicate in a very harmonious atmosphere. Together we will further pursue our common aim in order to protect our children from the sadists of the State and its barbaric torture, so that that all human beings on our planet can live and sleep quietly without torture and psychological terror! Heute waren schon 5 visitors (48 hits) hier!